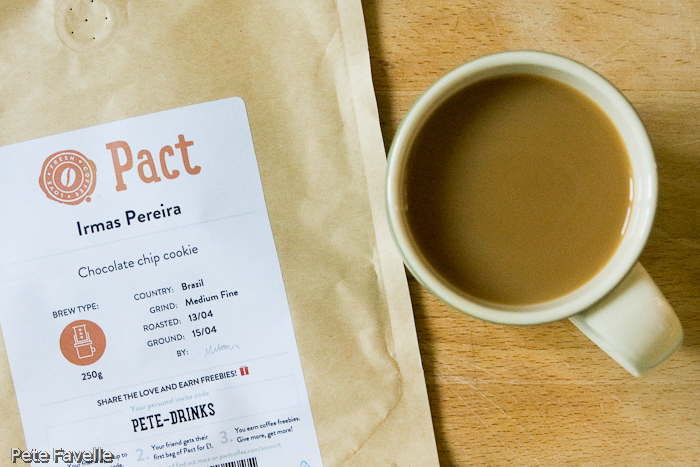 One thing I like about Pact is that their coffees always have a single-sentence summary on the packet; it’s obviously not a perfect description, but it sets your expectations quite nicely. Of course, the down side is that when you come to write a review, you have to try and ignore those expectations! Irmas Pereira is described as “chocolate chip cookie”, which sounds like my cup of coffee. The name comes from the Brazilian farm where the beans are grown and I find it strangely pleasing to read that the farm and I equally ancient, having been founded (well, born in my case!) in 1971. The grounds are medium roasted, with a gentle lime citrus aroma blending nicely with milk chocolate and perhaps a hint of digestive biscuit – although that may be the power of suggestion. Brewed, the fruit acidity becomes softer – more green apple than lime – but the chocolate remains in the background. In the mouth it’s quite light; soft and creamy with just a gentle tannic acidity in the finish. It’s not as rich as normally go for, but it’s very pleasant regardless – 3 stars.